Robinson's exit was predictable after Scottish rugby slumped to an all-time low with defeat to Tonga. There may well have been headline-grabbing victories over Australia, South Africa and Argentina during his tenure but 10 defeats in their last 13 outings is simply not good enough. But results are only part of the problem. Painfully aware of their shortcomings, he has been unable to lift the side to another level and conjure the kind of consistency required to silence their doubters. It was perhaps the manner of their latest reverse that convinced Robinson that he had taken the side as far as he could - once again they were out of synch and out of ideas. The defeat was hardly a giant killing as Scotland had their membership of the elite club retracted some time ago. They are as much a minnow on the global stage as their Pacific island rivals. The Scots' World Cup failings arguably signalled the beginning of the end with agonising defeats Argentina and England denying them a place in the quarter-finals for the first time in the tournament's history and robbing them of priceless momentum and confidence. A Six Nations Wooden Spoon would follow with the Scots' ranking suffering as much as their supporters. A shortage of talent hampered any great plan Robinson may have had for the side with the renewed policy of sourcing 'project' players from overseas with Scottish links coming too late to save him. His successor may benefit more from that approach but things are unlikely to get any easier in the short term with Scotland's third rate ranking set to ensure a nightmare 2015 World Cup pool draw alongside two of the world's best sides. They find themselves in a worrying spiral and are in desperate need of someone who can stop the rot. 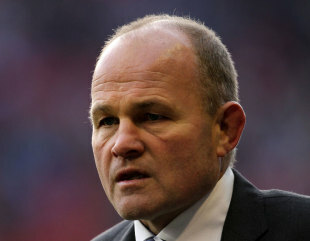 Andy Robinson has resigned as Scotland head coach. The Scottish Rugby Union confirmed Robinson's departure this morning, following the 21-15 loss to Tonga in Aberdeen on Saturday. Robinson had been under contract until after the 2015 Rugby World Cup. Scotland have lost 10 of their last 13 matches, including elimination from the World Cup at the group phase for the first time. The Tonga defeat was the 19th in Robinson's 35 matches in charge and comes at the end of a calendar year which began with the Six Nations wooden spoon. In a statement issued by the SRU, Robinson, who was appointed in June 2009, said: "It's been a privilege to be the head coach of Scotland and I'd like to thank the fans, players, coaches and staff for all their support over the years. "I have thoroughly enjoyed working with the players and the coaches in the last few years. I believe I have left the team in a better position than when I took over and have great confidence in the players and the coaches for the future. "I am very disappointed by our recent results but I have belief in the players to develop into a winning team." Robinson's most recent wins were on the June tour to Australia, Fiji and Samoa, and his era ends following a 51-22 loss to New Zealand, a 21-10 reverse to South Africa and the Tonga debacle which leaves Scotland in 12th in the provisional International Rugby Board world rankings. SRU chief executive Mark Dodson said: "Following the sequence of recent results during the EMC Autumn Tests a change in head coach is required to take the team forward and build towards the Rugby World Cup in 2015. "I have passed on to Andy Scottish Rugby's thanks for his hard work and commitment during his term as national coach. Andy has overseen some fine results as Scotland head coach since he was appointed in June 2009 but the recent defeats have been very disappointing. "Andy is an outstanding leader and a fine coach and we wish him well. I'd like to thank our fans for their great support during the Autumn Tests and look forward to welcoming them to Murrayfield for the home games against Italy, Ireland and Wales in the 2013 RBS 6 Nations." The search for Robinson's successor will begin immediately, with assistant coach Scott Johnson a contender. Former South Africa and Italy coach Nick Mallett may also consider the role worth the challenge.